Much to her former roommate Brooke’s (Reign Edwards) delight, Natalie (Amy Forsyth) has unexpectedly decided to join her best friend for a weekend of frivolity. But this first night back together is going to be even more freewheeling than she anticipated. 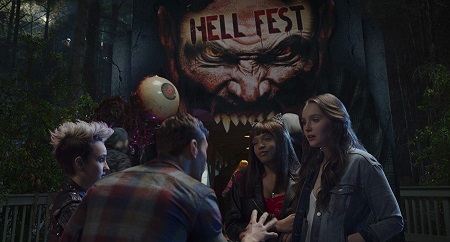 Turns out the guy Natalie has something of a minor crush on, Gavin (Roby Attal), has scored VIP passes to Hell Fest, a local horror-themed pop-up amusement park that has the whole town talking. This trio is joined by Brooke’s boyfriend Quinn (Christian James), current roommate Taylor (Bex Taylor-Klaus) and her beau Asher (Matt Mercurio), all of them prepared to experience a night of thrills and chills they’ll hopefully never forget. Unbeknownst to all of them a seventh individual has laid eyes upon their little group and he’s more than a little infatuated with them, especially Natalie. Following them around from attraction to attraction, they mistakenly dismiss this hulking “other” in a dark hoodie and ghoulish mask as just another entertainer paid to scare them. But his intentions are far more murderous than any of them know. By the time Natalie puts the pieces together and figures out how much danger they’re all in it might be too late for her, Brooke or any of the others to survive the night and not have their lifeless corpse hidden inside Hell Fest as an all-too-real prop of gory mayhem to unsettle the park’s clueless patrons. 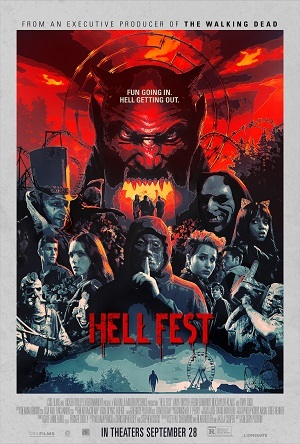 Basically a combination of Tobe Hooper’s Funhouse, John Carpenter’s Halloween and a random episode of “Dexter,” Hell Fest is a straightforward horror throwback that features an inherently creepy idea, an admittedly unsettling killer in “The Other” and a couple of suitably gruesome kills that got my pulse racing. It’s also frustratingly by-the-numbers, depressingly formulaic and disappointingly rushed during its climactic stretch. 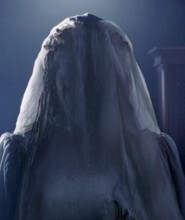 Director Gregory Plotkin’s (Paranormal Activity: The Ghost Dimension) latest is wildly uneven, and as much as I want to urge genre fans to head out and support original horror I’m just not certain this is a title I can recommend people take the time to see, not even as a matinee. Not to say I didn’t find plenty to like. As stated, there are a number of things Plotkin and his team of five credited writers do get right. The best thing about the film is undeniably the setting. This is the one horror entry where the overabundance of jump scares is all part of the plan. It’s a theme park designed to scare the living crap out of the attendees, so a variety of freakily-dressed individuals leaping out unexpectedly at the six protagonists at any given moment is just par for the course. For Plotkin, all of these little jolts are pure nightmare fuel helping set up the more austere, classically presented scares to come, the director using all of this sound and fury as visual misdirection to help make his killer far more terrifying than he otherwise would have been. The other thing that works is “The Other” himself. Faceless. Nameless. He’s a hulking beast who stalks his prey with cunning efficiency and brutal certainty. He’s a force of nature, his infatuation with Natalie a lethal mixture of desire, anger and admiration that only builds in toxic misogynistic authority as he gets closer to making her his. 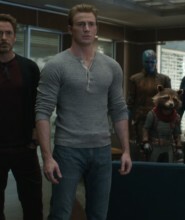 He is legitimately menacing, and even if the movie doesn’t always utilize him as well as I thought it maybe could have, that doesn’t make him any less petrifying as far as the bigger picture is concerned. Also worthy of mention? Bear McCreary’s (Backcountry, 10 Cloverfield Lane) thunderous, creatively ominous score works overtime to augment the on-screen action, while Michael Perry’s (It Follows) richly imaginative production design and Mark Dillon’s (God’s Not Dead: A Light in Darkness) lush, colorfully macabre art direction both add a level of creative ingenuity that’s appealing. But it’s all exasperatingly rudimentary. There are no narrative tricks up this film’s sleeves, no instance of clever subterfuge that could have helped build up the tension and get me to wonder which members of Natalie’s gaggle of friends were going to make it out of this night of terror alive. I just wasn’t emotionally invested, and as far as problems go it seems to me that’s a fairly difficult one to easily dismiss. I liked Forsyth, she and Edwards have strong, naturalistic chemistry that’s kind of wonderful. I also liked that the script doesn’t spend a lot of time dwelling on why Natalie and Brooke are such strong friends or what has happened in the former’s life that’s made her so reticent to open her heart to someone as obviously charming, honest and wholesome as Gavin. There’s also a terrifically staged sequence of unhinged, quietly nauseating dread when one of the six friends finds themselves stranded in a funhouse ride all alone after it appears to have mysteriously broken down, Plotkin doing a grand job of ratcheting up tension utilizing the most basic of cinematic techniques. If the final act had been just a little stronger, had there been any mystery as to what was going to happen, there are more than enough positives at play here for me to have left the theatre happily content. Instead the script doesn’t have any zing, doesn’t make any attempt to do anything other than what is expected, Plotkin unable to breathe any additional life into the proceedings directorially. Even a fun little cameo from horror icon Tony Todd didn’t do much more than bring a passing grin to my face that was quickly forgotten about mere seconds after it happened. While Hell Fest has its moments, while there is plenty here worthy of praise, none of that is strong enough to overlook the film’s more irritating missteps. Maybe I’ll change my mind later, but as of right now I just can’t do it.